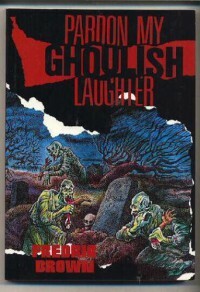 PARDON MY GHOULISH LAUGHER is a collection of mystery stories from the detective pulps. Most of these tales were originally written back in the 1940's. What fun! TWICE KILLED CORPSE- which had a nice little twist as well as a hero that wanted to be a detective. DEATH IS A WHITE RABBIT- which was a strange little tale with a remote hint of Dr. Moreau and his experiments. These things never go well. This book was a boatload of fun and reminded me of my pre-teen and early teen years when I read these types of collections. The old Ellery Queen's and Alfred Hitchcock's were always a source of entertainment, but somehow I missed Frederic Brown back then. With this collection and NIGHTMARES AND GEEZENSTACKS, (which I listened to last year), Mr. Brown has made made my list of memorable and witty short story writers. I'll be on the lookout for anything else of his I can get my hands on.